I was born and raised in Springfield, MO. I went to college at MSSC in Joplin, MO where I completed the dental assisting and dental hygiene program. After graduating in 1985, I moved all over the country, working and raising my family. I was thrilled to come back home in 1999. Mike and I have five sons between us named Jay, Tyler, Brady, Chris and Chad. We are very proud of each of them. I have been blessed with an incredible family and career. 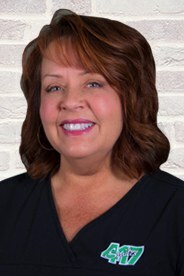 I love being a dental hygienist and feel fortunate to be a team member of 417 Smiles.